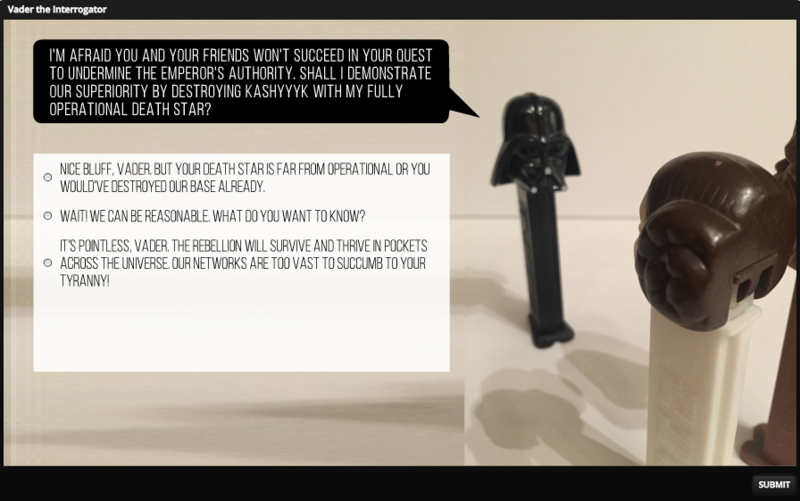 When David Anderson posted this week’s challenge to use toys in an e-learning project, I knew right away that I wanted to play with my husband’s Star Wars Pez dispenser collection—and a few of Articulate Quizmaker 13’s coolest but most under-the-radar features. My mission: to create something fun and a little challenging; something that felt more gamelike than a typical quiz. Here’s my project in action. I like using Quizmaker's timeline because it gives you the ability to arrange objects, set timings, sync animations, preview slides, and has options for working with audio and video as well. You can access the timeline from slide view in Quizmaker by clicking the Timeline tab. If this tab isn’t visible, you can expand it by clicking the arrow in the lower right corner of the slide to expand the Timeline and Notes panel. Here I used the timeline to set up my scenario and to stagger in talk bubbles that simulate the characters in conversation. Staggering objects in this manner is, in effect, animation. To animate objects on the timeline, simply drag them to the left or right along the timeline. To adjust the length of time they appear (their duration) drag the right edge of the object along the timeline until it disappears. The timeline is a really powerful feature in Quizmaker. 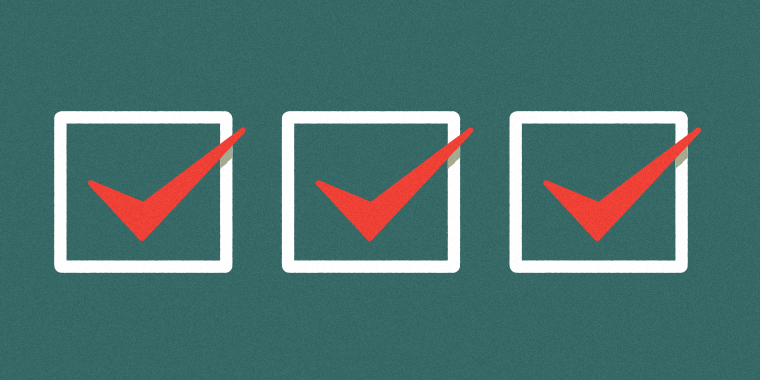 To get the most out of it, check out this helpful article from David Fair. I wanted users to experience the consequences of their choices. The easiest way to do that is by using branching, which lets you create a completely customized experience for your learners. To set up choice-based branching, you can select it from the feedback dropdown on the question panel in slide view or from the display menu’s feedback dropdown in form view. Once you’ve selected choice-based feedback, you’ll need to create the feedback text for each answer option and link to the slide that corresponds to the learner’s choice. Pro Tip: Branching makes almost any amount of complexity possible, but that means your design can get awfully big with an intricate scenario. To save yourself some development time—and preserve your sanity—it’s a good idea to first sketch out your branching on paper or in a flowcharting tool before you start building it out. 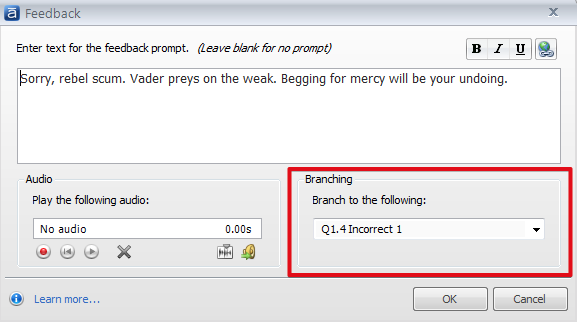 For some more step by step instructions on how to use branching in Quizmaker, check out this detailed walk-thru from David Anderson. 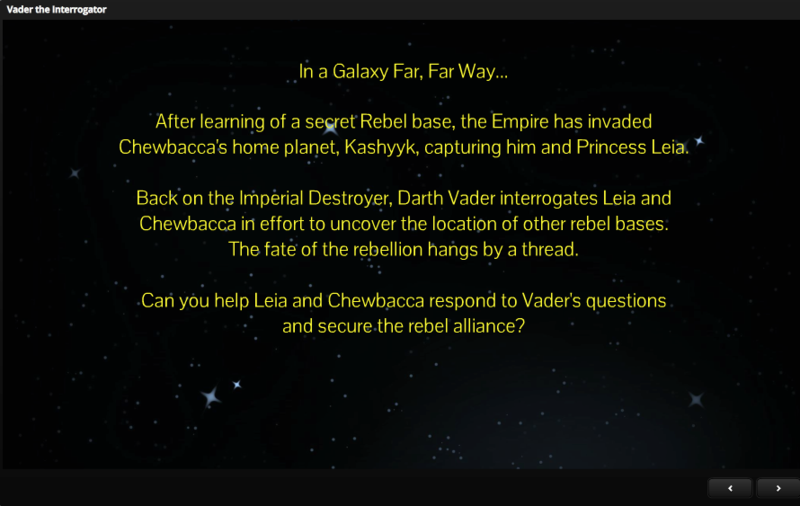 Want to introduce a scenario or summarize some supporting information for learners? 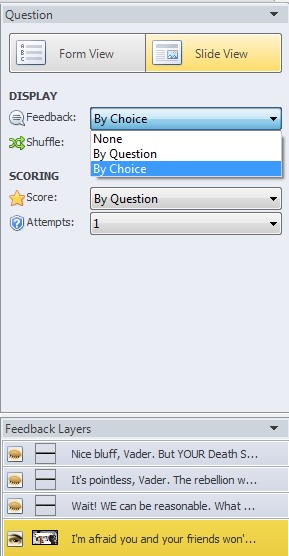 Quizmaker ’13 gives you the option to add blank slides to your quiz for non-question content. And if you decide later that you'd like to convert your blank slide into a question, you can do that, too. In my project, I used a blank slide to set the stage for the experience and provide some quick instructions. To do this, you can easily insert a blank slide from either the Question List View, Form View, or Slide View. One thing to note: because blank slides are not a question slide, once inserted, they don’t have a Form View; only a Slide View. If you decide later on to convert your blank slide to a question, Quizmaker also makes this painless. 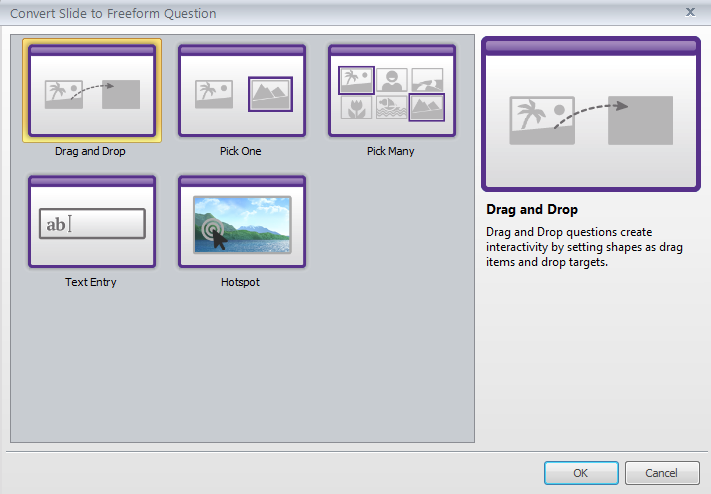 Simply select the Convert to Freeform option on the Question panel. From there, you can select the question type: either Drag & Drop, Pick One, Pick Many, Text Entry, or Hotspot. Simply customize the question, feedback, and the behaviors or results you're looking for in Form View or Slide View, and you’re ready to roll! For a deeper dive into the how-tos of blank slides and the Convert to Free Form option, check out this robust how-to article. What are your favorite cool features in Quizmaker? Share them with us by leaving a comment below. Follow us on Twitter and come back to E-Learning Heroes regularly for more helpful advice on everything related to e-learning. I guess you can tell I was feeling a little playful with this one, Christine! I've always felt that quizmaker is somewhat of a Storyline light. These three features will open a world of possibilities for the unknowing Studio user!